History of St Kitts Music Festival - Caribbean & Co.
Music festival tourism is a US$3.5+ billion dollar industry globally, and one of the more established music festivals in the Caribbean region is the St Kitts Music Festival. For over twenty years, a diverse range of local, regional and international musical acts many of whom are Grammy Award winners have held court in St Kitts during the third or fourth weekend in June. This past June saw the St Kitts Music Festival coming of age with its 21st-anniversary celebration, and there were approximately 28 different musical acts. The diverse lineup during the three nights included Creedence Clearwater Revisited, Jah Cure, Goo Goo Dolls, Mavada, Shabba Ranks, K Michelle, Ed Robinson, DJ Private Ryan, Phyllisia Ross, Lyrikal, and Ultimate Rejects. Also, personal favorites Third World who previously performed at the St Kitts Music Festival and Square One with Alison Hinds who gave such a commanding performance that during a brief rain spell she got the crowd to abandon shelter and come front and center. Alison Hinds’ dynamic performance left no doubt, that she is indeed the Queen of Soca! 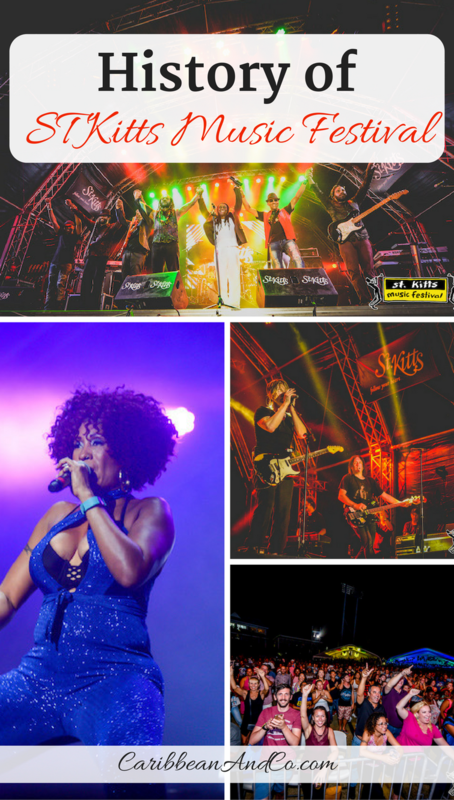 St Kitts Music Festival 2017: Alison Hinds. With such an eclectic and energetic range of musical acts, there was something for young and young at heart, also local and international visitors whose numbers are increasing each year during what is traditionally a slow period on St Kitts known formally as Saint Christopher and part of the Federation of Saint Kitts and Nevis. So how did the St Kitts Music Festival get started? Below I provide some insight! 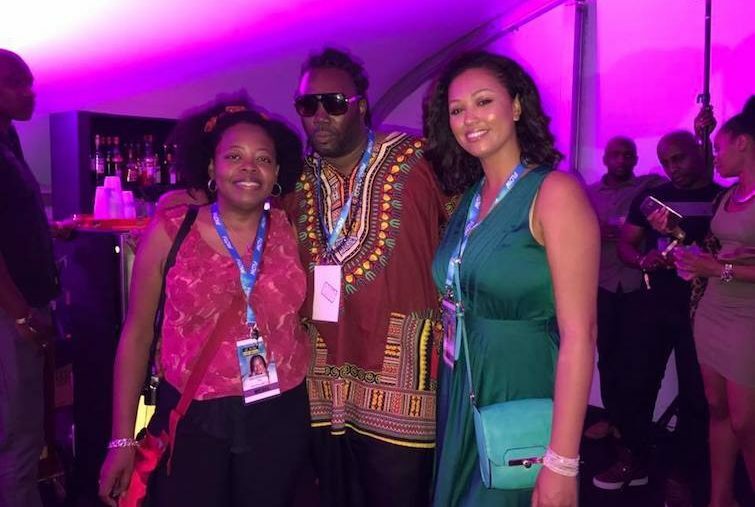 St Kitts Music Festival 2017: Hanging out with Rachel Ritfeld and Paul Gadiethz in one of the VIP tents. The St Kitts Music Festival was launched in 1996 and attracted an audience of 8,000 over four nights. Twenty-one musical acts that were either Soca, Reggae, Rhythm & Blues, or Gospel were part of the first St Kitts Music Festival including Ellie Matt & GIs Brass, Krosfyah, Arrow, Tabou Combo, Latin Legends, Freddie Jackson, Mighty Clouds of Joy and Cece Winans. The impetus for the St Kitts Music Festival back then and still today is to increase stay-over visitors during June. Launched by the minister with responsibilities for the St Kitts Tourism Authority, the St Kitts Music Festival gives music lovers a reason to visit St Kitts in June and ultimately help boost the economic activity for the tourism sector including hotels, restaurants, car rentals, tour operators, etc. The St Kitts Music Festival also provides an opportunity for Kittitians to see musical performances by a wide variety of artists who previously had not performed on the island. 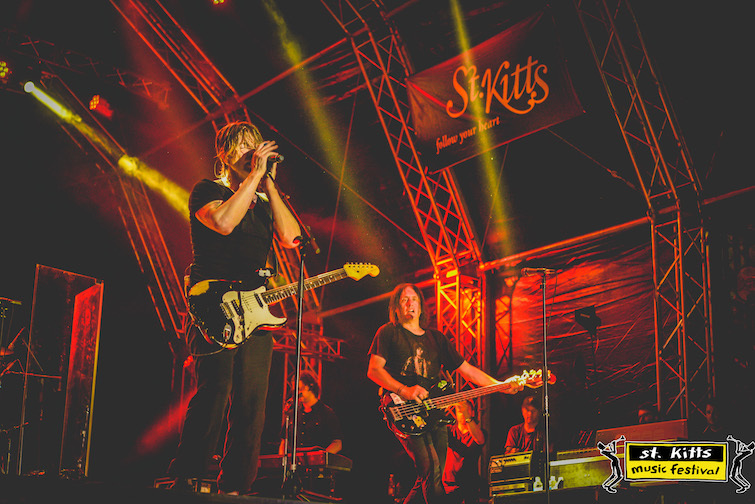 St Kitts Music Festival 2017: Goo Goo Dolls. Interesting, the St Kitts Music Festival was initially called the Shack Shack Music Festival. What is a Shack Shack you ask? Well, it’s apparently the dried pod seed from the flamboyant tree which is the national flower and found throughout St Kitts. The Shack Shack Music Festival name though intriguing was short lived as there was a desire to more efficiently market the festival and St Kitts brands internationally in primary source markets including the United States, United Kingdom, and the broader Caribbean region. Then in 2007, the St Kitts Music Festival changed from four to three-nights dropping the Gospel evening since this element wasn’t as strongly supported as the others nights of Soca, Reggae, Rhythm & Blues. 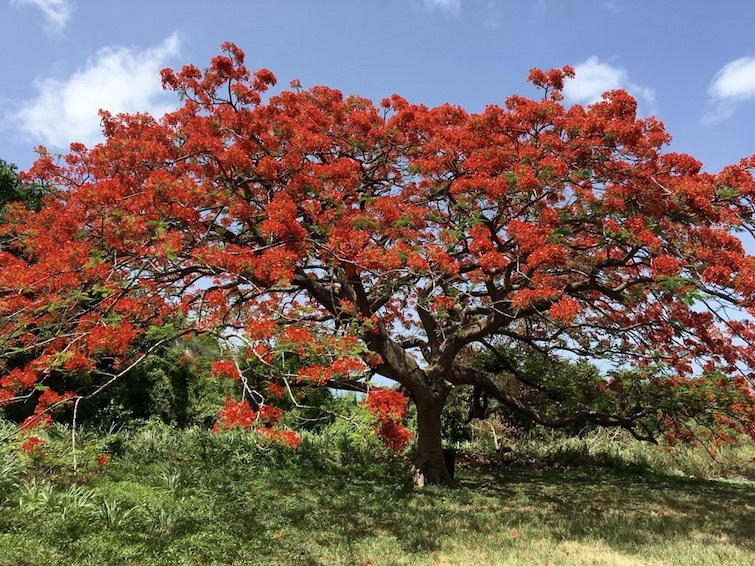 St Kitts: Royal Poinciana aka Flamboyant Tree. Since 1996 with an average of 20 musical artists each year, over 420 local, regional and international artists have performed at the St Kitts Music Festival. Initially held at the historic Fort Thomas Hotel, the St Kitts Music Festival venue is now the Warner Park Sporting Complex which was one of the hosts for the 2007 Cricket World Cup and has a much larger area for attendees to watch and dance to the performances with two major VIP tents and various food and drinks vendors. Starting at around 9ish each evening, it gives visitors a chance to explore St Kitts during the day visiting one or more of the top tourist attractions, while partying the night away listening and dancing to the diverse musical acts with regular tickets costing EC$100 or US$40 and VIP costing EC$360 or US$135. For all three nights, it’s EC$1000 or US$380 which is quite reasonable when you factor in the number of international artists and the cost to see them in the United States or Europe. St Kitts Music Festival 2017: Third World. 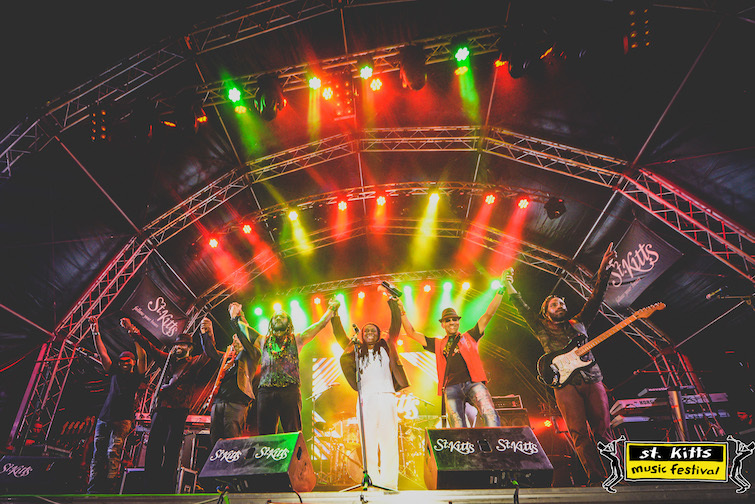 This mashup of Soca, Reggae, Rock, and Rhythm & Blues musical artists each year helps the St Kitts Musical Festival attract local and international attendees in a comfortable party atmosphere. The stadium can hold around 10,000 each evening, but with attendance, in the 3,000+ range, you can easily move around to watch the performances or get a bite to eat and drink at one of the many vendors in the back if you don’t happen to be in a VIP tents that have a prime view of the stage. 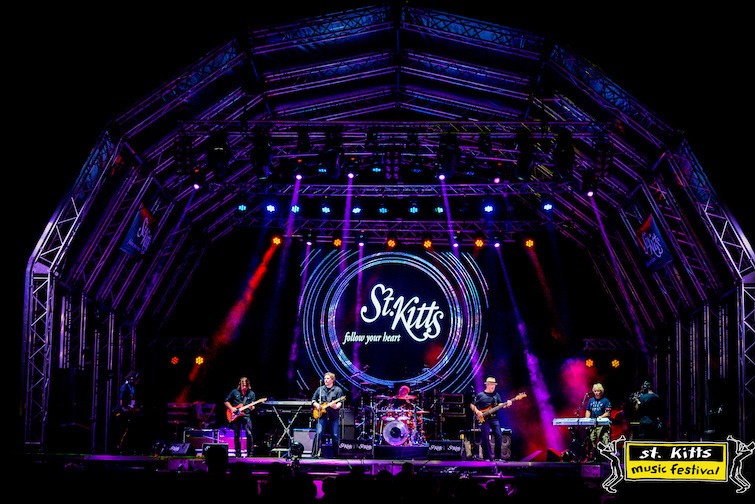 So for now, the St Kitts Music Festival with its high caliber of musical performers is still an undiscovered gem on the international music festival circuit which has its origins in the hippie era. St Kitts Music Festival 2017: Creedence Clearwater Revisited. Beyond the evening performances at the St Kitts Music Festival, there are quite a few fringe daytime and after festivals events. One of the more popular events worth attending is the White Sands Party by Carambola Beach Club. 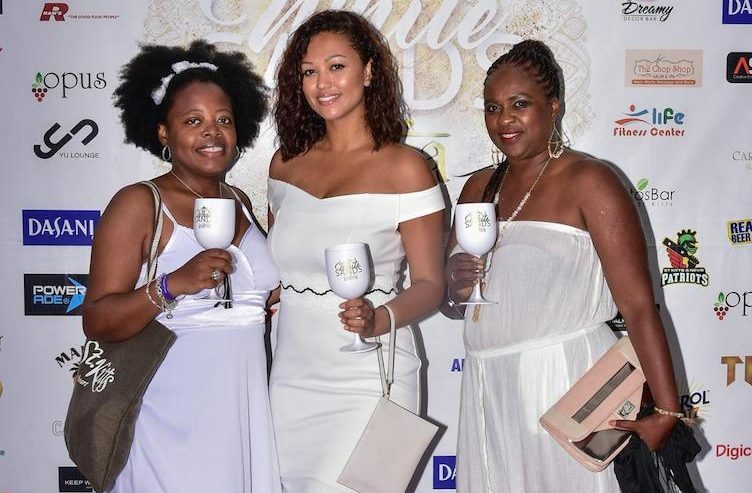 An all-white beach party, White Sands bills itself as the cooldown event of the Saint Kitts Music Festival with a swimsuit competition and headline musical acts like Jamaican reggae artist Christopher Martin. St Kitts: Hanging with Rachel Ritfeld and Jennifer Hensley at the White Sands Party by Carambola Beach Club. Photo Credit: © Aryana/Carambola Beach Club. As the St Kitts Music Festival looks to capture an even higher share of the music festival tourism market, no doubt they will continue to book more international acts drawing visitors to the island which has so much more to offer than just sun, sand, and beautiful beaches. A part of the Leeward Islands in the Caribbean, St Kitts has a range of historic tourist attractions including Brimstone Hill Fortress National Park, the only man-made UNESCO World Heritage Site in the Eastern Caribbean. St Kitts is also known for its Scenic Railway the only one of its kind in the Caribbean along with former sugar plantations like Romney Manor home to Caribelle Batik. Sister island Nevis also offers up a wide range of historic tourist attractions and is a mere 10 minutes from St Kitts by water taxi from Reggae Beach. For more information and the schedule of artists for next year’s festival, visit the website for the St Kitts Music Festival. Note that the host hotel for the event is the St Kitts Marriott Resort & The Royal Beach Casino. So if you want to bump into the artists in the lobby on their way to morning press conferences or in the evening as they depart for the musical festival, this is the hotel to stay at while in St Kitts!